As I mentioned previously, I am currently on a mission testing various hair care – it’s now time for round two. 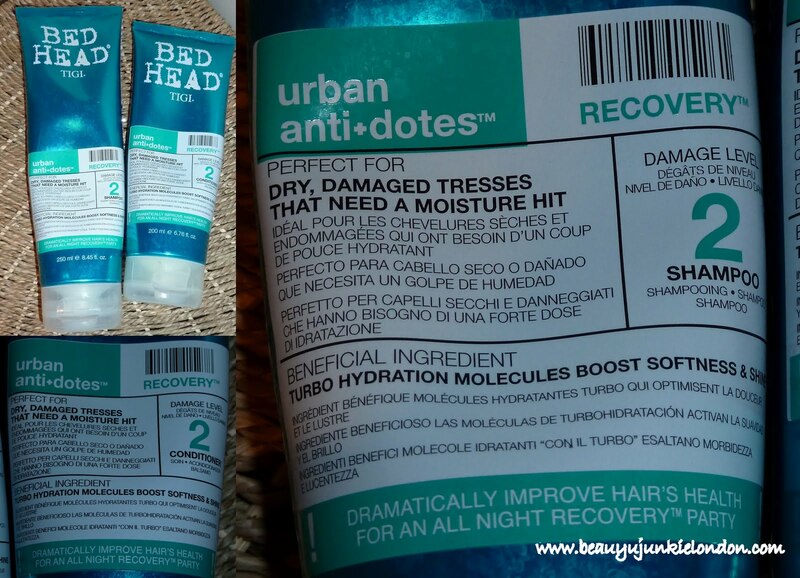 Next up on my list is Tigi Urban Antidotes shampoo and conditioner, which I have been using for around two weeks now. First impressions are mostly around the smell – the smell really reminds me of ‘millions’ (the tiny chewy sweets), it really is a very sweet smell so I can imagine it will split opinion. I should mention though that there are three versions of Urban Antidotes (1, 2 and 3) all designed for different levels of need – 1 is more cleansing, less moisturising, 3 is super moisturising for very dry/damaged hair and two is somewhere in the middle – I’m trying number two and of course the other versions do smell different but all pretty much good enough to eat. The packaging is a big win with me too – probably just because turquoise is my favorite colour. There is something a bit ‘prescription label’ about about the packaging too, which works well with the recover/anti-dotes theme. The shampoo lathers nicely and feels rich but very cleansing at the same time. The conditioner absorbs well and doesn’t just coat the hair in silicone (although it does contain silicone) and leaves it soft and smooth. On one day whilst testing this I used just the shampoo without the conditioner and felt my hair was a bit knotty – just my personal view, but I definitely need both. One thing that kinda bugs me about the shampoo and conditioner is the size of the bottles – the shampoo is larger than the conditioner and I can see myself easily running out of the conditioner and being left with shampoo on it’s own. I can’t really explain why this irritates me, but it does – I like to buy/use shampoo and conditioner in pairs and when one runs out before the other it just doesn’t feel right! Maybe I’m just odd…. I should also mention that since the weather in London/the UK is pretty hot at the moment I have been letting my hair dry naturally which is a good test of the shampoo and conditioners ‘weighing down’ credentials. My hair is naturally fine and does tend to be flat without styling – when I have used the shampoo and conditioner my hair is pretty average, not weighed-down but not weight-less, it could still do with some hairspray. But it definitely wasn’t flat as a pancake and I wasn’t embarrassed to be out with my hair naturally dried. Overall, a lovely shampoo and conditioner that will definitely appeal if you have a soft spot for sweet smells. Hair type-wise, I feel this is best suited to those who are a bit harsh on their hair with regular dying and heat styling plus piling on the products. That is what they are designed for, after all… it definitely packs a good moisturising punch. Provided as PR samples for review. I’m working on a hair-saloon in Sweden and I’m going to try the Shampoo and Conditioner (Urban anti-dotes) within the next weeks. Look forward to it. Great blog by the way. Both my daughter (age 22) and I used this product for around 4 weeks and now find we both have dandruff and a very itch scalp at night. We have both had to discontinue using it shame as I had bough the 750ml bottles (two lots) of each. We normally use TIGI Bed Head Urban Antidotes Re-Energize Shampoo & Conditioner No1 with no problems. Needless to say we are both back on that.